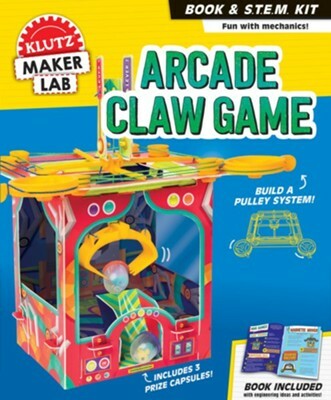 Now kids can make their own arcade claw with this fun kit from Klutz. Designed for ages 8 years and older, kids can construct their own claw machine by building a frame, wrapping string around a pulley system, and attaching a claw. Then fill it with DIY prizes or items you have around the house. Kids will learn all about the physics of pulleys and the real-life application of claws. Includes additional activities for more fun. Promotes STEM/STEAM learning. Includes: 32-page book that explains the physics of pulleys, force, and motion, chipboard parts, acetate windows, cotton string in 2 colors, 2 plastic dowels, 2 wheels, 2 tall pulleys, 6 short pulleys, carriage, claw, and plastic snaps. I'm the author/artist and I want to review Arcade Claw Game Book and Maker Kit.